Mirzapur: Terming Banaras Hindu University (BHU) as a "temple of education", Uttar Pradesh deputy chief minister Keshav Prasad Maurya said on Wednesday that the state government would not allow it to be turned into a "political battleground". 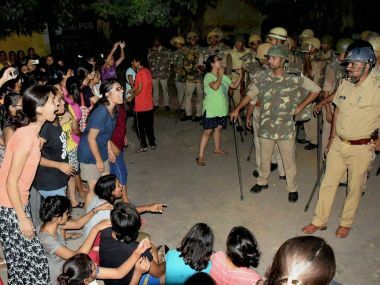 "Some students holding protest in BHU wanted to turn the temple of education into a battleground of politics, but the government will not allow this at any cost," he told reporters. "BHU was set up by Pandit Madan Mohan Malviya on the basis of some ideals and principles and not for doing politics as is being done by the Opposition parties...The government will never allow such designs to succeed," Maurya said. The deputy chief minister paid a visit to the famous Vindhyavasini shrine. He said the government would act on the matter on the basis of the findings of inquiry. Asked about the poor state of affairs in the Vindhyachal, he said various development works had been taken up in the six months of the BJP government and that the good results would be visible soon. The aim of the state government is to make a "pothole-free, corruption-free, fear-free and development-oriented Uttar Pradesh", he said.